Peacocks Clinical Services is a team of lower limb, foot and whole person Musculoskeletal specialists based at 1a St Thomas Street, Newcastle upon Tyne, NE1 4LE. 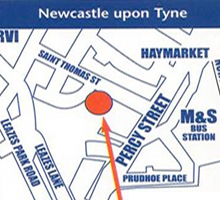 Peacocks Clinic is accessible via Haymarket Metro (200m), Haymarket and Eldon Square bus terminus (100m and 200m). If arriving by car, there is disabled parking in St Thomas Street; Eldon Garden parking is 150m away. If you have specific access and mobilty problems, please call us. This involves detailed static and dynamic examinations to determine anomalies that may be causing injury, pain or reducing performance. 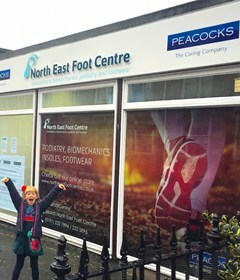 Peacocks shop and Podiatry clinic in the centre of Newcastle between the Haymarket and RVI has fully qualified Reflexologists. Reflexology can help with relieving stress and tension in the body as well as much more.